Meet Shawn.... For years Shawn was pretty unhappy with the appearance of his teeth. 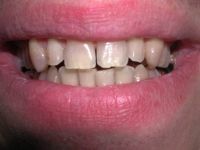 He didn't like the color and shading, and he didn't like how they were shaped and had uneven sizing, rather than the symmetrical appearance of healthier or normal tooth structures that we are all supposed to have. The positioning of several tooth structures was also something that Shawn wanted to change. Dr. Sussman and Shawn reviewed several case history examples of previous patients who had received different combinations of reconstructive and restorative treatments. To find out how cosmetic dentistry can enhance the health and beauty of your smile, please call Dr. Sussman and Dr. Pogal's Rochester office at 585-227-4390 today. Our dentists serve patients in Brighton, Fairport, and other communities in the Greece area. As with most of our treatment plans, patients have multiple choices of similar treatments that differ in the type and quality of components used for restorations, which assures our patients affordability for an almost limitless variety of cosmetic and functional goals. Shawn's interests kept changing as he learned more and more about what can be achieved in restorative dentistry. Originally focused on Zoom teeth whitening that could give him the pefection in brilliance he wanted, he eventually changed his expectations to include not only bright healthy teeth but to have teeth that were sized appropriately and gave the appearance of matching his face, smile and jaw structure. Shawn had always felt his smile was too narrow for his face. Shawn also wanted to get rid of some aging amalgam fillings that were beginning to take their toll on his back teeth. Articulation studies with used with the impressions that were taken, along with diagnostic wax up models. 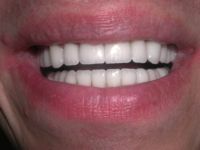 Shawn ultimately chose to have a variety of custom fabricated ceramic components consisting of crowns and porcelain veneer laminates that would enable him and Dr. Sussman to literally construct a new smile. Temporary crowns and veneers were used as part of the study, to assure Dr. Sussman that all of the important functional changes would be accurate for maintaining normal occlusal relationships. The wax up modeling process gave Shawn the assurance that he would achieve the precise cosmetic goal he was looking for. Adjustments were made as needed... both for Dr. Sussman and for Shawn (functional and aesthetic) to assure that there would be no surprises (errors) in the final and permanent restorations. Shawn had all of the ceramic materials made from the Empress family of high grade porcelain crowns and veneer laminates. Empress products have the physical characteristics needed for creating restorations that can nearly duplicate what Mother Nature normally provides... natural looking, natural feeling crowns and veneers that feel like your own teeth. The veneers were hand crafted, one by one, to provide a perfect match in coloration, shading and sizing to Shawn's original teeth and to the new crowns that were used. 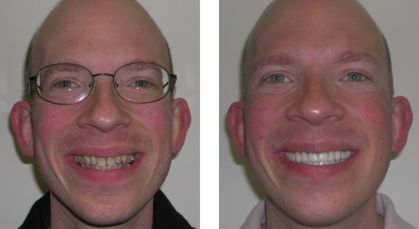 In the adjacent post treatment photo it can be seen that Shawn's smile, involving both arches underwent a complete reconstruction. The 24 units of new Empress porcelain gave Shawn the broad smile and smile line (characteristics of the incisal-biting edges of the top teeth) he had always wanted. Needless to say... Shawn was thrilled with the outcome. The reconstructive makeover was an immediate success. The experience of the makeover result will impact Shawn for years to come. Self confidence and self esteem issues reached new highs for Shawn. Contact our office at 585-227-4390 to learn what kinds of treatment choices are available to achieve practically any functional or cosmetic result you may be looking for. Dr. Sussman or Dr. Pogal can provide the information you need for getting the degree of change you may be looking for.. in a variety of ways. Our cosmetic dentists serve patients in Brighton, Greece, Fairport, and other communities in the Rochester area of Upstate New York.